This vehicle has 2 fuse panels, one located in the driver’s side panel bolster, the other in the engine compartment. If any of your vehicle’s lights, accessories, or controls do not work, check the appropriate circuit fuse. 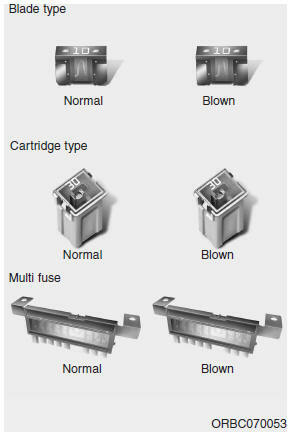 If a fuse has blown, the element inside the fuse will be melted. • Never install a wire or aluminum foil instead of the proper fuse - even as a temporary repair. It may cause extensive wiring damage and a possible fire.